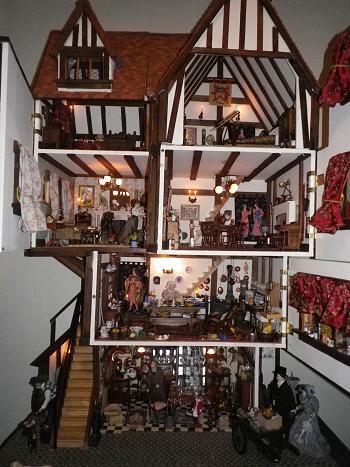 Two years after Margaret sent us photos of her lovely Georgian dollshouse – she sent us pictures of her Tudor dollshouse! In the picture above, the floor is nearly covered by the William Morris style “Elizabeth” carpet, with a “Jessica” footstool in the foreground. On the walls, there are two wallhangings, “Millais” (no longer available) and “Cluny Women”, and the sampler, “Love Is Enough”. 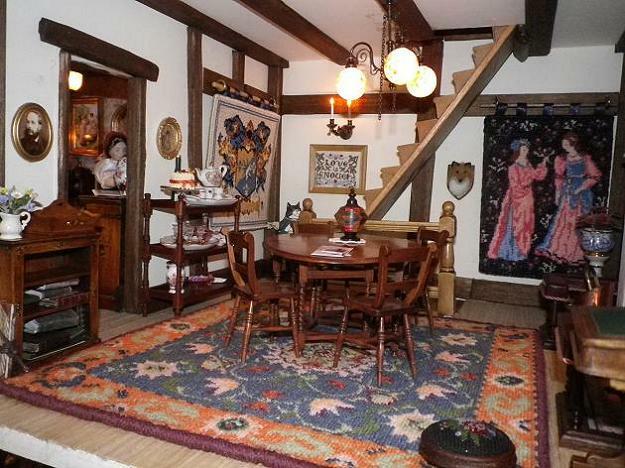 In this cosy room, there is a “Barbara (green) ” carpet, with a matching bellpull on the far wall. 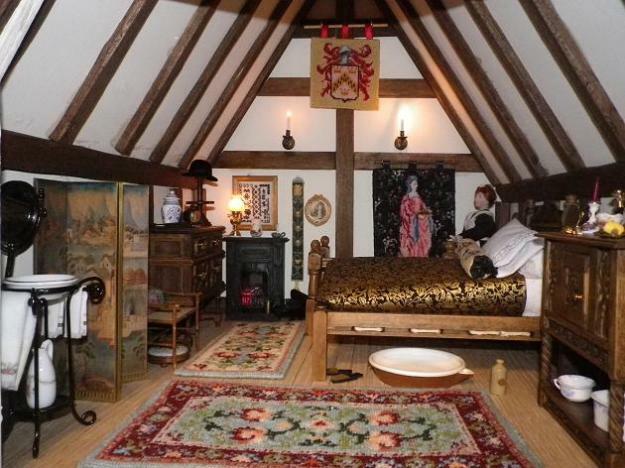 This amazing bedroom shows two “Carole” carpets – the one in the foreground is “Carole (jade)” and at the foot of the bed is a narrow runner which Margaret has made by adapting the centre of the “Carole Jade” and using some different colours – very clever! Next to that, on the chair is an “Anthea” bolster cushion and a footstool under the chair – is it an “Alice (blue)”?. 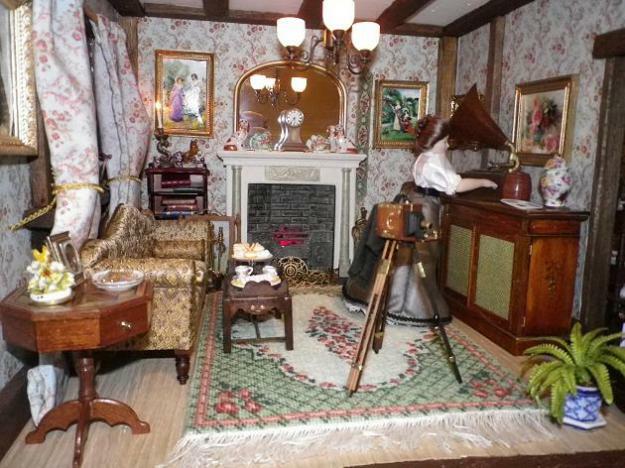 On the far wall, she has displayed a “Blackwork” sampler, an “Art Nouveau Tulip” bellpull, and two wallhangings: “Cluny Maid” and “Chevron” (hanging from the high beam). 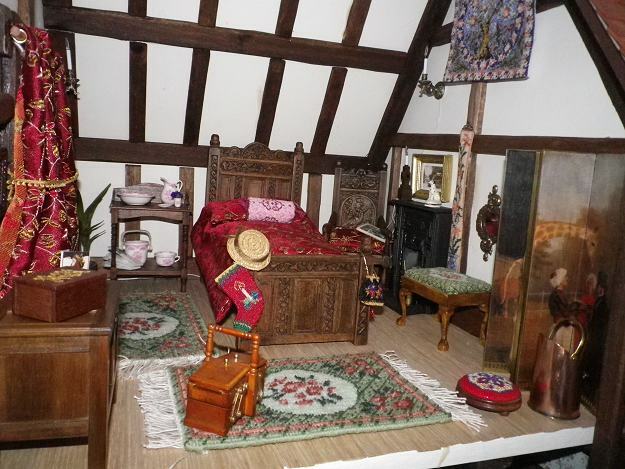 The Berlin Woolwork handbag is one of the three that Margaret made (one is in her Georgian Orangery), and is shown hanging on the bedpost of the carved bed in this room. Also featured are two Barbara small green carpets, an Orange Tree wallhanging (up high on the right hand side), a Katrina footstool, an Orange Lilies bellpull (no longer available), a Pink Lace bolster on the bed (no longer available), and a Candle Christmas stocking. What a wonderful house – Margaret you have been busy!